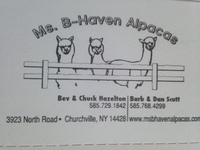 Ms. B-Haven Alpacas is a farm located in Churchville, New York owned by Bev & Chuck Hazelton, Barb & Dan Scutt. It's that time of year. Time to get ready for summer. Come and watch the Alpacas get sheared. Listen to them complain and then enjoy it afters. come and help or just watch. the kids will enjoy touching the alpacas on there level. and browse thru the other vendors. The Ms. B- Haven Alpaca farm started as just an idea. Barb Scutt had always loved these fluffy animals. Then one day Barb invited her sister-in-law Beverly Hazelton to go to a fiber arts festival. They deiced that they should start a farm together. 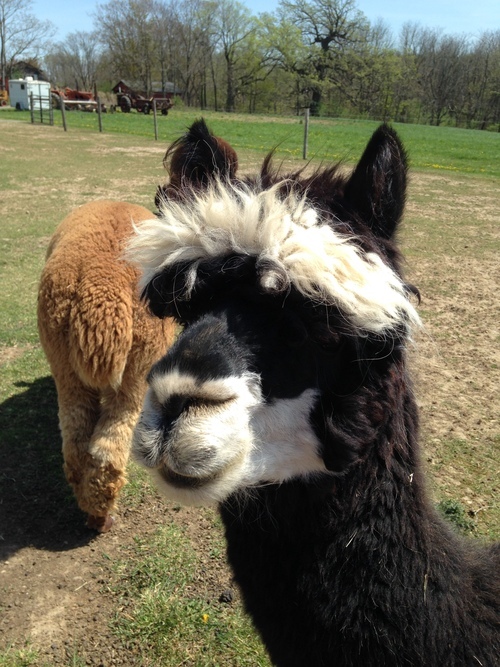 So the four of them Barb & Dan Scutt, Bev & Chuck Hazelton started their Alpaca adventure. 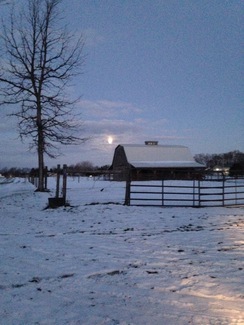 After lots of research the first barn was erected in 2004. The farm started with just three bred females. 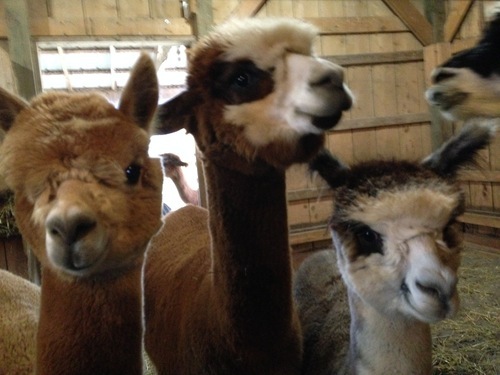 These three were so cute that Barb and Chucks mom decided that she also wanted an alpaca, she owned the farms first male. Our alpaca family expanded on July 3, 2004 when our first cria was born. This cria shares a birthday with Bev & Chucks daughter, who declared that since it was born on her birthday that she should name it! This tradition stuck and now any immediate family member gets to name the cria if it is born on his or her birthday. Over the years the farm has acquired a few other species. Barb & Dans granddaughter wanted ducks, now there are too many ducks to count. Even if you could count them sometimes a wild duck or two decide to move in for a few days. Then came the goats, one of those just magically appeared one day and you can't just have one! There are now three goats, Taylor, Daryll and Daryll. Maybe the other Daryll will also magically appear someday. Then Barb wanted a miniature donkey. She renamed him Howard, which happens to be Chucks real name! Definitely something that only siblings can get away with. The farm has come a long way. 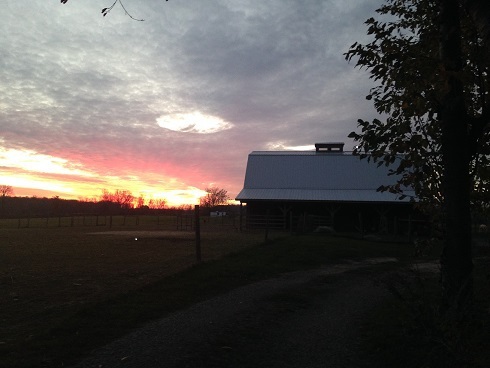 There are now three separate barns that house a total of forty alpacas. Each has a name and their own personality. 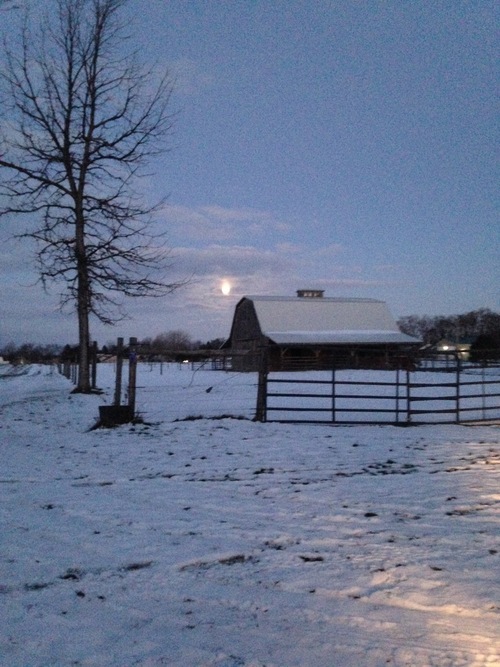 The farm invites people to meet the alpacas through out the year by special appointment or at events. There are two special events. In the fall every year there is an open house. 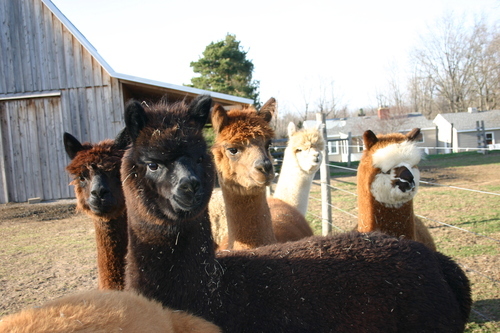 The third weekend in September, is national Alpaca farm days. Anyone interested can come see the whole farm and feed and touch the alpacas and learn all about alpacas and what they are used for. Then in the spring there is a shearing festival. This event is to show anyone interested how silly an alpaca looks when naked. You can also learn more about the care of alpacas. We encourage people that would like to, to get right in there and help with the process. When the alpaca is shorn the fiber is processed into all sorts of products. Both Barb and Bev use the yarn to create unique one of a kind items for the farm store.